A native of Abadan, Iran, Faramarz Assef is not only a popular singer among all Iranians, but also a well-known name in the sport of track & field. 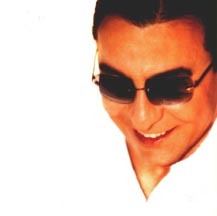 Assef recorded his first album "Afra 1" in 1984, which was then followed by "Afra 2" in 1988, "Afra 3" in 1993, "Afra 4" in 1998 and this latest release, "Afra 5" in 2002. With his record of 10.08 meters, Assef is still the Iranian national record holder in the triple jump since 1974. He is also a bronze medallist in the same event at the Asian Games, which were held in Tehran, Iran in 1974. Assef was a member of the track team (1976-1980) at the University of Southern California (USC), where he also received his bachelor degree in architecture.